The annual repeated cycle of seasonal central heating and plumbing repair. With the changes in seasonal weather variations in request for particular plumbing repair may increase or decrease in popularity. During the summer some repairs become none existent until the cold annual cycle of winter returns each year . 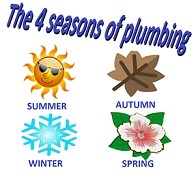 Throughout the year the changing seasons dictates the requests and frequency of particular plumbing tasks. Although winter is the busiest part of the year for plumbers, household fixtures and fittings can become faulty at given point of the year. 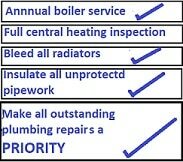 Quiet often difficulties in finding a plumber in winter is because an increase demand for boiler repair commits some engineers to that sector work. Rather than general house hold plumbing enquires such a leaking tap or faulty toilet. Common plumbing enquires during winter. The majority of plumbing repair that takes precedence during the winter in some way relates to the central heating. Central heating related enquires comes at the top of the list during the winter, the loss of heating in winter escalates a boiler breakdown from merely being an after thought to a necessity. Relative to this would be requests such as a radiator not to getting warm in a particular room. Pipework and radiator leaks that become evident especially on a poorly maintained central heating system. Modern condensing boilers continually release small amounts of water via a condense pipe, this pipe can easily be identified it is a white plastic pipe fitted below the boiler. If this pipe terminates internally then the heat retained within your property should be adequate enough to eliminate any possibility of the pipe freezing. However, it could be the mixture of the use of an undersized pipe and an outside termination that often leaves some boilers vulnerable to an outside freeze. A frozen condense pipe is rare but occurrence’s like this become commonplace during extremely cold weather. Burst pipes are a common occurrence in winter the cold weather can affect pipework that is situated either outside or in a remote unheated area of a property. However, it takes a combination of factors to actually seize the water supply and fracture the pipe. A continuous temperature of zero and below cold wind and snow coupled the lack of insulation in these circumstances will inevitably lead to a freeze. Most popular request in summer. The skilled trades that become dormant in winter such as builders often gain momentum during summer and on occasion, a plumber is required. 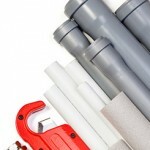 Some builders have the skills to carry out extension plumbing work without the use of a plumber. However, building an extension may require the relocation of a boiler. 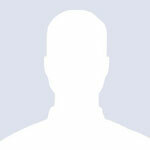 This type of work requires an individual that is qualified and competent to carry out gas related work. Central heating extensions and boiler relocations are popular during summer. With a combination of builders contractors and property owners working towards the completion of there projects while the weather is still warm, a skilled gas engineer will be in demand. A slight less demanding task that’s is constantly being requested during the summer is the installation of an outside tap. 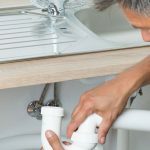 The installation is usually a quite straight forward task as long as there is a cold supply pipe in close proximity to the point of installation. During hot weather comes the increased use of the water supply, washing cars, gardening or the kids out playing in the paddling pool. Having an outside tap can fulfil all of these requirements without having to make numerous trips carrying water. Autumn preparation for the cold winter ahead. After autumn comes winter within this period preparation to plumbing can be carried out before the cold temperature outside becomes uncomfortable to work in. Exposed pipework can then be insulated to repel the oncoming cold weather in winter. This type of pipework protection may even be required in a loft due to exposure and the seasonal fluctuating temperature in lofts. With the central heating being dormant during the summer months an annual service in autumn will optimize your boiler to operate within the safe parameters of the instruction manual. Behind a boilers casing, there can be water leaks corrosion or other defects that can affect the operation of a central heating system . An annual Autumn preparation will help to reduce the possibility of a boiler break down by eradicating problems that could escalate into an emergency boiler repair during winter. Quite often emergency plumbing repair during winter can be avoided by implementing these miner protective measures.